This Purple Sweet Potato Smoothie Bowl is so easy to make and requires just 2 ingredients. It’s a beautiful lilac colour, a shade very rarely naturally found in the food we eat! It’s perfect for breakfast because the sweet potatoes will charge you with lots of sustainable energy to keep you fuller for longer. Just cook some sweet potatoes at the weekend, keep them in your freezer in individual portions, then take them out in the morning and you’re only one blend away from a delicious and healthy start to the day! 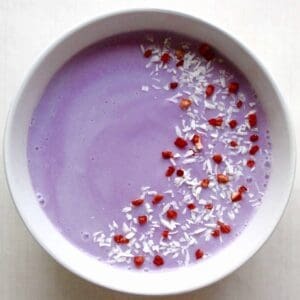 This Purple Sweet Potato Smoothie Bowl is so easy to make and requires just 2 ingredients. Made this for breakfast today and it was great – it’s really filling and gave me lots of energy! I bought a case of purple sweet potatoes last fall. I still have a lot left. Just a plain bake is not cutting it anymore. So glad to find you site with some summer recipes to help use up the rest of them. Very excited to try these. Amazing, thank you so much. Glad you’ve found the recipes helpful!